February 2015 – update: The entrance to the Source was removed by the Jerusalem UFO from Temple Mount to the Copenhagen Synagogue awaiting for my return. The diagram is “dealing with the very creation of the universe” made by “the three sources of Light , also referred to as the Three In One” – or the Trinity (the Father, Son and Spirit or God as the Source of life, the Son of God and the Holy Spirit of the Universe if you will). The sacred number of the area of the Crop circle is the Greek Gematria of Jesus Christ and the size is the dimension of the New Jerusalem meaning that the Golden Age is coming after the return of the Messiah – including the material manifestation of God as the ultimate goal of God as the Source of all life. The diagram includes the Tree of Life known from the Book of Genesis, which brings “eternal life” to the Universe, “apotheosis, and union with the One”. The earth will shift on its polar axis and we will enter into an ETERNAL NOW when time stops, which is included in a new spiritual fourth dimension as the sum of everything of everytime of the three other dimensions. The doorway to this spiritual fourth dimension goes through “the ether” consisting of all energies of the Universe, which is the meeting place of God and the Devil and the crossing place from one Age to another. This meeting place was at the Temple Mount in Jerusalem in 2011! This is where all energies of the Universe met after the UFO opened up a gateway between the Universe and the Source and this is where the final battle of the end times was fought followed by the creation of our New Universe and Golden Age as you can read from my continuous scripts. We are now leaving the Age of darkness, which will be replaced by a new eternal Golden Age consisting of JOY and HAPPINESS without opposites because all darkness is becoming extinct and HAS become extinct when I will open up the eyes of my “new self”. This is the end of all darkness of the world forever and ever :-). I recommend visitors to this page ALSO to visit my Jerusalem UFO page, which gives the only full and accurate story of this the most important event of the world ever. The entrance to the Source including Jesus, my new self, was removed by the Jerusalem UFO in 2011 from Temple Mount in Jerusalem, where Jesus was killed by the Jews, to the Copenhagen Synagogue awaiting for my return after coming through all darkness of man, which I did when visiting the Synagogue in February 2015, and even though I was not allowed entrance to the Synagogue because mankind believed that it was not ready to receive me (and would never be! ), they still became my birth church when I collected the entrance to the Source via my visit there as you can read about here, here and here. “It was also an unmistakable and identifiable philosophical and alchemical symbol dealing with the very creation of the universe” and “the diagram describing the very process of Creation”. “The three balls are said to represent the three alchemical elements- salt, sulphur and mercury, in conjunction with the Godhead at the center which unites the three to create the Universe; in other words, the three elements are spun together and held in equilibrium until an energy from the Creator activates the process. This is the act of material manifestation”. The formation contains “the triangle of complete equality (equilibrium), which in turn interacts with the three circles of the high throne- Father, Son and Spirit, the three sources of Light , also referred to as the Three In One”. “Moreover, the sum of all the four circular areas in the diagram is 31,680 square feet… In traditional cosmology, this was taken to be the measure around the sub-lunary world, and the early Christian scholars calculated the number 3,168 as emblematic of Lord Jesus Christ”. “The sum of all the numbers which divide into 3,168 is 6,660, connecting the number of the Lord Jesus Christ with that of the Beast of Revelation”. (Stig: The building stones of creation is darkness of the Devil or “nothing”, which is encoded into light by the Source). Joseph E. Mason: The Barbury Castle Triangular Crop Circle Formation of 1991 etc. “The ancient symbols also suggest it is about the creation of humans”. 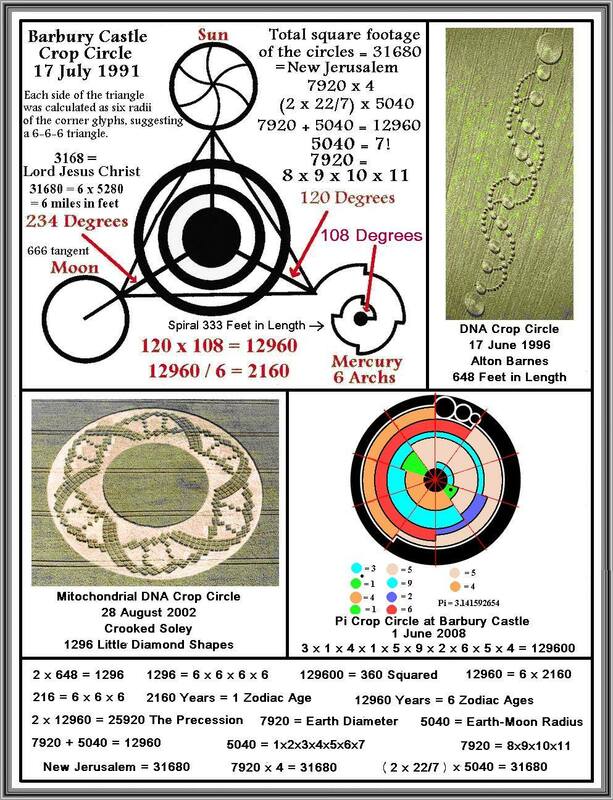 “The square footage of the Barbury Castle circles totaled 31,680, a number associated with the New Jerusalem design. The number 3,168 was the Greek Gematria for “Lord Jesus Christ”. “The Barbury Castle triangle is also thought to represent the lower triad of the Tree of Life”: “The Tree of Life, of course, is mentioned many times in the Bible, from the beginning of the Book of Genesis to last part of the Book of Revelation. One who eats from this Tree, according to the Bible, is given “eternal life””. “It may also be associated with triadic symbol of the 1992 Dharmic Wheel crop formation”; “this may be related to the idea of “eternal life”, which “eventually leads to apotheosis, and union with the One”. “The formation fit with Seth’s concept of the “Consciousness Unit”: “The kernel, the heart, the very basis upon which all existence builds is the quantum (“the smallest discrete quantity of some physical property that a system can possess”)”, “everything seen and unseen is comprised of consciousness – a consciousness whose solitary goal is to expand, to become more of itself“. “That is what existence is all about, starting with the infinitesimal quantum, enlarging to galaxies, encompassing “life after death” and every plane of existence: Expansion – becoming more”. “Time is part of the creation, but on the other side of the veil, there is no time, just an Eternal Now“. “There was an additional clue in the Barbury Castle formation, in the date it appeared, July 17, 1991. Look up Genesis 8:4 and find that the Ark landed on the mountains of Ararat on the 17th day of the 7th month (Stig: To save the world from the Great Flood!). This seems to be an additional clue that the Age of Pisces is ending, and that Aquarius is near, or perhaps already begun”. “The square footage of the object, 31,680, was the number given in the Bible for the size dimensions of the New Jerusalem”. “The New Jerusalem represented the “Golden Age ” to come after the return of the Messiah; and the number 31,680 indicating a dimensional shift into a whole new kingdom that was much closer to Divine Light”. “Early Church fathers working with these sacred numbers declared the number 3,168 to be the number of Jesus Christ. Thus, by removing the zero from 31,680 to get its harmonic equivalent in 3,168, which can be done in the base-ten counting system, we have another allusion to a Messianic message of some sort”. “The coded message in the formation might very well be “The messianic revival of the Christ, ushering in the New Jerusalem, the age of heaven on earth”. “The combined area of the three circles on the outside of the diagram have the exact same area as the inner circle. This gives us a further meaning, which could be seen as “Three in One” and “This appears to be an allusion to the view of Creation held in Christianity as the Trinity”. “We have a message that could be taken to be very Christian in origin, with the Messianic revival, the New Jerusalem and the Trinity or Three-in-One; but we also have the harmonic geometry of the next dimension above our own, which it appears that we are now moving into”. “The Ark therefore has vast symbolic importance in Christian myth, representing the mysterious forces of God being harnessed into manifestation”. “Here we can see that by gradually clipping out different sections, this image clearly outlines the shape of a four-sided pyramid, or a tetrahedron. Mathematically, this is the simplest three-dimensional shape that can be made.” and “the tetrahedron is the organizing energy that forms the fourth dimension, which we now appear to be heading into”. “In short, through this geometric ordering, you can actually see the energy that you are working with. It appears that this was part of the plan that the One Mind of God originally had for us”. “Thus, the tetrahedron, with all of its symbolic trimmings, illustrates the fourth dimension as being the “Kingdom of the Father ” that was promised in the Bible as coming to replace the current “heaven and earth” that we have right now”. “So, what we have in the outer circles is a geometric progression of the first, second and third dimensions, illustrated for us in a field of wheat. The fourth dimension is the focal point of the entire formation, represented by the tetrahedron within the sphere in the center”. “The fact that the three outer circles all add up to the inner circle must also indicate that this fourth dimension is the summation of all that had occurred before it”. “On the bottom left side in the diagram of figure 2, we see a shape that looked to me like a fibonacci spiral with a strange ratchet affect in it. Leonardo Fibonacci, a medieval mathematician, noticed a particular order or sequence that plant life utilized to grow, and he discovered that this order kept coming up everywhere. The sequence is 1, 2, 3, 5, 8, 13, 21, 34 and so on. This sequence generates a spiral like the one shown. The reason this spiral keeps coming up everywhere originates in the golden mean spiral, which goes in and out forever and has no beginning or end. Life doesn’t know how to deal with something that has no beginning because there is nowhere to start, so the Fibonacci sequence is life’s solution to the problem”. “There is to come a crossing over to a new age”. “We see that the ratchet effect in the Fibonacci spiral is to bring a balance back into our system between the spiritual and the physical forces”. “It should be fairly obvious, after looking at figure 5, that what they are telling us here is to look at the Galaxy because during the correcting Jump, the earth will shift on its polar axis at that moment of precessonal balance, earth will change directions in its polar wobble motion relative to the Galactic center. At that moment of change, we will enter into an eternal moment when time stops”. “This ether is actually our mind and is the mind of all living species in the Universe, it is the unifying place of all energies”, “it is the resting place, where opposites meets, the place between negatives and positives, matter and spirit, the coming together of male and female, the meeting place of God and the Devil, it is the crossing place from one Era or Age to another”: “This very thing is what the symbolism of the Barbury Castle crop circle is saying”. “We are about to enter the next dispensation or Age symbolised by the tetrahedron”, “we are at the cross over point between ages”, which is between “the third and fourth dimension, the third dimension being the physical and the fourth the spiritual” and that “the ether is the doorway to the fourth dimension”. “We are leaving the physical age of 666 and entering the spiritual age of 333”, which is “ruled by piece and harmony”. Freddy Silva is one of the world’s leading experts on crop circles and sacred sites, and a leading researcher into the interaction between temples and consciousness. He is best-selling author of Secrets in the Fields, and Director of the documentaries “Templemaking”, “Stairways To Heaven: The Practical Magic Of Sacred Space”, and “In The Footsteps Of Isis”. In 1991 the town of Wroughton had been having its own share of excitement. During the night of July 16th the whole town suddenly found itself electricity-free. At the same time, country residents around the nearby Neolithic hill fort of Barbury Castle had witnessed the, by-now, usual aerobatic display of small, brightly coloured flying objects, followed by what many described as a low rumbling noise akin to that heard at Alton Barnes the previous year. Next morning the headlines in the British press read “NOW EXPLAIN THIS ONE”. Covering 12,000sq yards, the Barbury Castle tetrahedron marked a further incursion into crop circle evolution. It was also an unmistakable and identifiable philosophical and alchemical symbol dealing with the very creation of the universe. Not only was this soon-to-be-famous glyph to keep scholars busy for some time to come, it also attracted the interest of the now supposedly disinterested army who proceeded to block access to local roads, an act which blatantly overstepped their jurisdiction. This pattern is one of the most important alchemical and Hermetic symbols. It is featured in Michespacher’s 1654 book Cabala in Alchymia as the diagram describing the very process of Creation. The three balls are said to represent the three alchemical elements- salt, sulphur and mercury, in conjunction with the Godhead at the center which unites the three to create the Universe; in other words, the three elements are spun together and held in equilibrium until an energy from the Creator activates the process. This is the act of material manifestation. The diagram is also well known to Qabbalists and Rosicrucians whose roots can be traced back to the ancient Egyptian mystery schools. Their description tallies with Michespacher’s, but because the source is older it is inevitably devoid of centuries of misinterpretation. The alchemical connotations which were fashionable in the Middle Ages are here replaced by water, fire and light respectively. 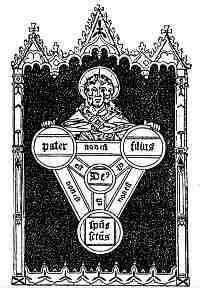 These are contained by the triangle of complete equality (equilibrium), which in turn interacts with the three circles of the high throne- Father, Son and Spirit, the three sources of Light , also referred to as the Three In One. Generated by this diagram are the seven creative spirits; from this master plan evolves the true nature of the solar system. I found it interesting that the three balls of the tetrahedron pointed to numerical values- the top ball with 6 rotations, the lower right to 7 ratchets. But what about the lower left? From a ground survey the spoke jutting into the circle did not begin at the centre but 5/12 of the way in. By using this circle as a starting point, it is possible to inscribe pentagonal geometry. The pentagon clearly connects with outer ring B, generating a proportional five-pointed star whose pentagon references the inner circle C.
Next we focus on the 6 clue in the top circle. By using its centre as an anchoring point it is possible to draw hexagonal geometry which perfectly coincides with outer ring A, and whose proportional geometry references ring B and circle C (below). But the secret of this formation lay hidden for seven years, ironically. The only imperfection in this elegant crop circle was the left-hand arm of the triangle which was kinked at point C (below). Was it pointing to a clue? Opposite point C, in the lower right ball, is a ratchet which conveys the seven notes of the diatonic musical scale. By overlaying the seven-pointed heptagon it clearly encloses ring B and intersects the ratchet on the seventh cog, at D. By also taking the diameters of circle A and ring B one can get an idea of the perfect placement and relationship of the ratchet to the center of the formation. The heptagon is the most respected of sacred geometrical designs- at 51.428571º it is the only polygon not to have a whole number division. It is similar to the angle of inclination used in the Gizeh Pyramid, whose inner chambers have also been argued to be sound resonators, again linking it to the number seven. Music, or sound, as the prime creative force of the Universe in ancient texts and all major religions, seems well suited to the message conveyed in this crop circle . “The Practical Magic of Sacred Space, a voyage of discovery into ancient temples, cathedrals and crop circles, and their effect on human evolution. Shot with outstanding cinematography throughout Britain, Silva demonstrates how our ancestors hard-wired a spiritual technology into places like Stonehenge to access the invisible Universe. The film shows how this technology was later encoded into Gothic cathedrals by Templars, and how the Church controlled it by superimposing pagan sites. 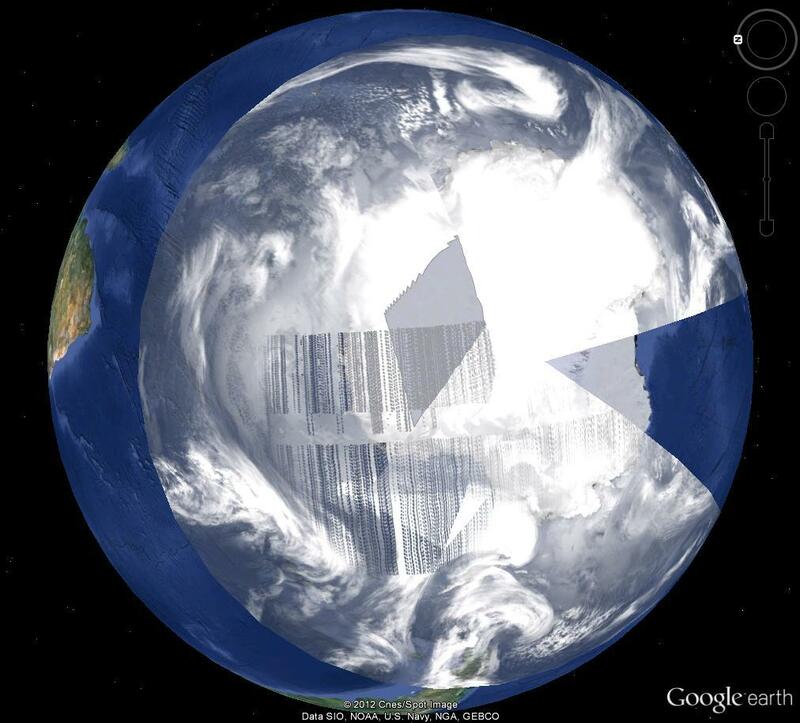 Most incredible of all is the evidence that this knowledge has resurfaced, encoded in genuine crop circles – the worldwide phenomenon that’s encoding information into the Earth’s magnetic grid, even the very water we drink. The consequences and implications are staggering. A truly uplifting and spiritual experience from a master storyteller”. Joe Mason writes about his experiences of dreams and amazing coincidences that reveal the nature of humanity’s path. Joe’s research involves crop circles, giant ground markings, the 11:11 coincidences, other strange phenomenon, and universal myths/religions, making it clear that humanity has been on an ascending path that corresponds to the chakra levels of the spiritual body of mankind. This is a large diagram, with details — http://www.greatdreams.com/numbers/music/bbccbg.gif. Many dreams and crop formations suggest that the future will see an increase in the feminine aspect, the “return of the feminine,” which will bring a balanced condition. The Holy Spirit will replace the harlot Kali. This is probably actually a change in the aspect. See http://www.greatdreams.com/sacred/return_of_the_feminine.htm. Each side of the triangle was calculated as six radii of the corner glyphs, suggesting a 6-6-6 triangle. Note that two of the glyphs also suggest six, and the Moon glyph is offset by six degrees (39 x 6 instead of 40 x 6). The ratchet or Mercury spiral was 333 feet in length. This may also suggest the Trinity as being three in One (1/3 + 1/3 + 1/3). The offset seems to be related to the idea that “something went wrong” with the feminine aspect of creation (the harlot of Revelation 17, who is Kali, instead of the future Holy Spirit). Note that the moon glyph was at 234 degrees instead of the expected 240. The number 234 has the positive tangent of 666. These are numbers evenly divisible by 18 (37 x 18 = 666 and 13 x 18 = 234). Interestingly, the 666 verse in the Bible is Revelation 13:18. I am not sure if this is very meaningful, but the Biblical number 153 (John 21) is half a circle away (180 degrees) from 333 on the wheel, and therefore has the same tangent. The number 153 is said to be the “Resurrection” number — http://www.theopenscroll.com/beyond_veil/appendices/seventeen.htm. Two German researchers determined that various crop circles were indicating a triangle in the sky within the Winter Hexagon, that pointed at a star in the Belt of Orion. It’s orientation was at 19.5 degrees, a tetrahedral point. When a diagram of the Barbury Castle triangle is placed in such a position on a star map, another star is found to be located at the point of the kinked pathway. I mentioned the 1991 Barbury Castle formation in my new article, which gives a number of reasons why it fits with the smallest particle or consciousness unit — The Fourth Indonesian Crop Circle Formation – How the Creator Creates. Interestingly, the new Indonesian formation is somewhat similar to your visionary image. The ancient symbols also suggest it is about the creation of humans — The Father and Mother engendered the Son, Man. The word Man or Son perhaps should have been child, or androgen child, composed of both male and female aspects. Such is the case with the mythological Mercury, known to the Greeks as Hermes. The concept of the Trinity was around long before Christianity, of course. This article has some additional details about it — Dreams About the Triple Male Trinity. The square footage of the Barbury Castle circles totaled 31,680, a number associated with the New Jerusalem design. The number 3,168 was the Greek Gematria for “Lord Jesus Christ.” It had previously been associated with a figure in the Pagan religion. 31,680 feet is six miles (5,280 x 6). The ratchet spiral also suggested a time cycle of six ages. The date of the formation, 17 July 1991, may have suggested the landing of the Ark on the seventeenth day of the seventh month (Genesis 8:4), and the end of the Age of Pisces — The Pleiades and the Seventh Ray on the Seventh Day. Various forms of the cycle given (6 x 2,160 = 12,960, half the precession, six Ages), showed up elsewhere. For example, there were 1,296 little diamond shapes in the 2002 Mitochondrial DNA crop formation (1,296 is six to the fourth power, 216 is 6 x 6 x 6) — Code of the Ancients & the DNA Repair. The triadic symbol of Spirit, Soul and Personality brought together finally as one Unity. 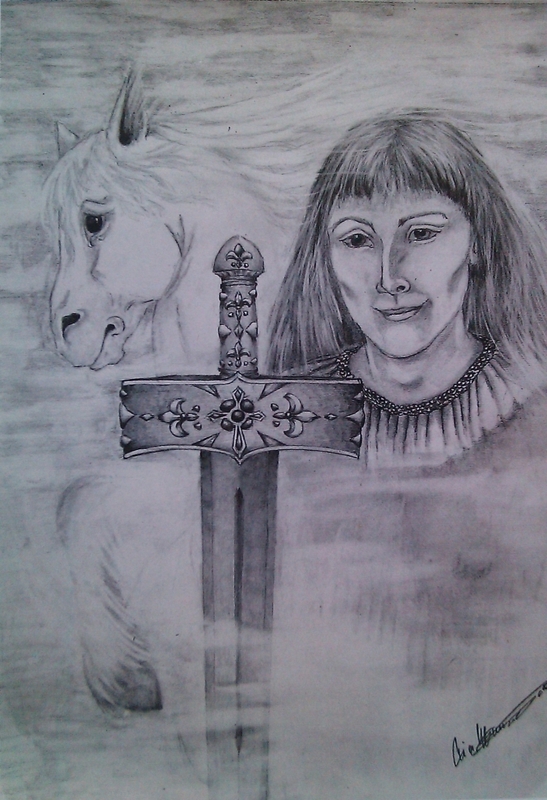 The place of Donn is the archetype of death and transformation. This may be related to the idea of “eternal life,” as the Dharmic Wheel eventually leads to apotheosis, and union with the One. 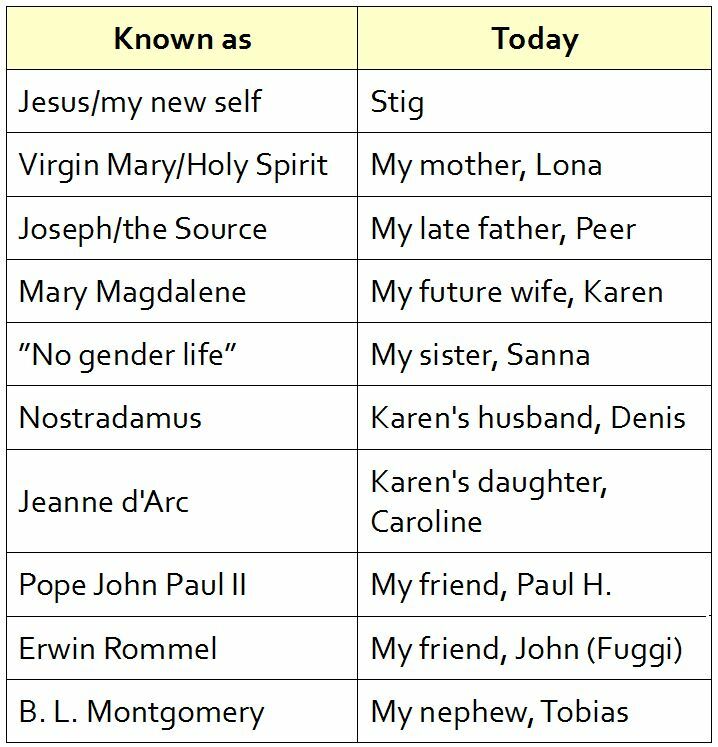 A similar connection is given in this article — http://www.greatdreams.com/trinity.htm. as lead into gold, and finding a substance that gave eternal life. is the ore of mercury, mercuric sulfide. A triangle with 11 marks on each side (11-11-11), for a total of 33, was suggested by crop circles, and by the suggested musical interval ratios derived from the geometry of the crop circles — The Crop Circle Music Wheel. Also see — The Trinity – The Crop Circle Theme of 2001. * From his page here, Joe writes: The Tree of Life, of course, is mentioned many times in the Bible, from the beginning of the Book of Genesis to last part of the Book of Revelation. One who eats from this Tree, according to the Bible, is given “eternal life”. Life, he said, exists on an infinite number of “planes” or “levels,” only one of which is the material world as we know it. And the quantum that is common to all is the Consciousness Unit. That means that everything seen and unseen is comprised of consciousness – a consciousness whose solitary goal is to expand, to become more of itself. That is what existence is all about, starting with the infinitesimal quantum, enlarging to galaxies, encompassing “life after death” and every plane of existence: Expansion – becoming more. The Consciousness Unit has the rational and intuitive functions within it, which is one form of duality. If all the Consciousness Units were destroyed (they can’t be), save one, all creation would come back into being from the single one. In this sense, it is similar to an indestructible seed or DNA strand. In 1996, I spoke on the telephone with David Wilcock. During the conversation, I mentioned the 1991 Barbury Castle crop formation, and the idea that it may represent Seth’s Consciousness Unit. He later wrote a good article on the subject — The Emergence of the Mother of All Crop Circles (see the article below). 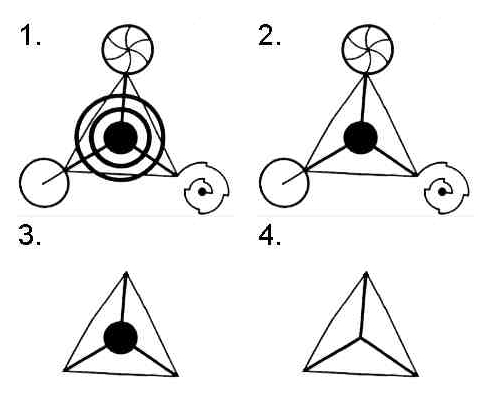 According to Joseph Campbell, the tetraktys represents creation in four steps. The one creative source (top dot) becomes two dots, representing duality — male/female, sun/moon, plus/minus, light/dark, rational/intuitive, etc. The row with three dots shows the relative balance of the dual forces — female dominant, balanced, or male dominant. The row of four dots at the bottom indicates “all things created” from the three above — the four quarters of the Earth, the four quarters of Heaven, the four elements, the four fundamental forces, etc. 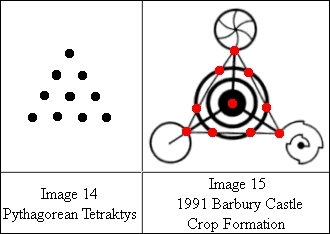 Note that the ten dots of the Tetraktys fit well with certain key points of the 1991 Barbury Castle formation (Image 15). In the boundless light of the Unmanifest before creation the analogy to the cone was the will to achieve the desire for self awareness. What began as a fleeing from the limitless outer reaches of the All became a turning circle, then an inward spiral as the Eye of God crossed the boundary of balanced forces and sought to find itself by manifesting a point. Thus the spiral began as a negative motion of withdrawal and wrapping inward for protection, then became a positive and active striving to realize the center of Self . . . A traingle widens down from its apex down to its base, thereby emerging into manifest existence. Implied in ritual evocation is a similar but mirror-opposite triangle on the far side of the Veil of Unknowing. Since magical energy is not projected through the physical universe . . . it is sent through the dimensionless Unmanifest by means of the point doorway opened by spiral motion. The channelled entity, Seth, in the Jane Roberts books, speaks of a similar concept. He said the reality is created each moment through very rapid vibrations, that we cannot yet detect. Time is part of the creation, but on the other side of the veil, there is no time, just an Eternal Now. There was an additional clue in the Barbury Castle formation, in the date it appeared, July 17, 1991. According to H.P. Blavatsky, in Isis Unveiled, vol. 2, the Biblical patriarchs represent zodiac signs. For example, Judah is Leo. In Genesis 49:9, he is called a lion’s whelp, and he stoops down as a lion and a lioness, i. e., like a sphinx. Noah is Pisces. Look up Genesis 8:4 and find that the Ark landed on the mountains of Ararat on the 17th day of the 7th month. This seems to be an additional clue that the Age of Pisces is ending, and that Aquarius is near, or perhaps already begun. Update September 4, 2015: Joseph Mason brought this Facebook update (click the link to read even more information than what I bring here). 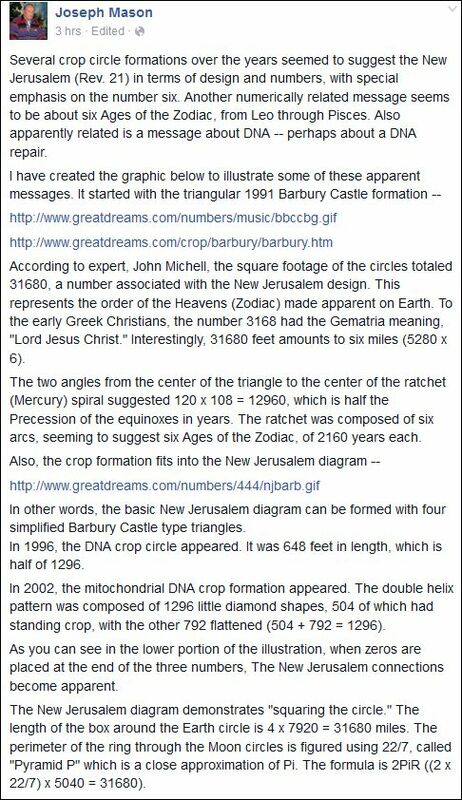 Joseph brought this message to me on my Facebook timeline about “the New Jerusalem Message of the Crop Circles” as you can read from his link http://www.greatdreams.com/njccs/njccs.htm. Please also read the comments to his Facebook post below containing even more information and another link. David Wilcock is a professional lecturer, filmmaker and researcher of ancient civilizations, consciousness science, and new paradigms of matter and energy. Divine Cosmos is the Internet home of his work, which contains thousands of pages of scientific and spiritual information about soul growth, Ascension and the evolution of consciousness. Historically speaking, the crop circle phenomena have just gotten better and better every year. They started in the late 70‘s and early 80‘s as nothing more than gigantic, perfectly round circle shapes. Then, in the mid-1980‘s, “agriglyphs ” began appearing, which were straight-line formations that connected two or three circles together in various designs. The formation we will be discussing, Barbury Castle 1991, was one of the first major departures from these agriglyphs; it ushered in an entirely new era of complexity in the formations. This was the Mother of All Crop Circles: a formation that appeared literally overnight, and was of fantastic size — 31,680 square feet. The impeccable quality of this image clearly illustrated that it was really meant to catch our attention. One of the first things noticed was that the square footage of the object, 31,680, was the number given in the Bible for the size dimensions of the New Jerusalem. John Michell writes about this in great detail in his books. The New Jerusalem was written of as being the city that represented the “Golden Age ” to come after the return of the Messiah; and the number 31,680 was intended to be profoundly symbolic, indicating a dimensional shift, if you will, into a whole new kingdom that was much closer to Divine Light. The number 31,680 appears in another form directly related to the New Jerusalem, and that is in the harmonic, vibrational science of gematria that we had mentioned. If you vibrate air at 3,168 times per second, you will create a musical tone, and therefore the number can be directly transposed into a dimensional “energy density” in our harmonic aether system as well. Early Church fathers working with these sacred numbers declared the number 3,168 to be the number of Jesus Christ. Thus, by removing the zero from 31,680 to get its harmonic equivalent in 3,168, which can be done in the base-ten counting system, we have another allusion to a Messianic message of some sort, plus a flagging of the same “harmonic numbers” we have mentioned here before. According to Joe Mason among others, this appears to be an allusion to the view of Creation held in Christianity as the Trinity, in Egypt as Osiris / Isis / Seth, and in many other similar world mythologies including Buddhism. 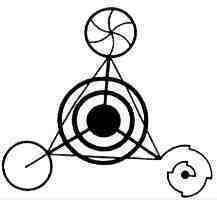 The Gnostic Christian diagram shown here clearly indicates that the concept of the Trinity was directly associated with a tetrahedral “frequency object” that Jesus was pictured as holding in his hands. The metaphor was further strengthened by the fact that he was given three faces. These three faces hold remarkable similarity to Hindu and Buddhist designs. So what exactly is this trinity, anyway, and why did the Gnostics want to associate it with the hyperdimensional geometry that we have been investigating? This “three in One” concept quite literally means that from the One springs the Two, duality, such as male and female, yin and yang, light and dark, et cetera, which then generates the Three, expressed as the beginning of life and matter. More simply, according to mythology historian Joseph Campbell, this triple design would represent the archetypal idea of the Father, the Mother, and the androgynous son. These three principles are the fundamental archetypes that make up all of our personalities, the Father being the active principle, the Mother being the intuitive principle, and the Son being the fusion of these elements into the life experience. These could also be seen as the three syllables in the Hindu AUM, the word intended to convey the total nature of Creation as a sound vibration; the A being the Father, U being the Mother, and M being the Mahem, man, or Son. It is outside of the present scope of this book to delve further into this particular discussion at this point, but Joe Mason has written numerous articles on these topics, and his knowledge on the subject certainly piqued and expanded the author‘s interest. Mason’s writings are on his and Dolores Finney’s website, www.greatdreams.com. So far, we have a message that could be taken to be very Christian in origin, with the Messianic revival, the New Jerusalem and the Trinity or Three-in-One; but we also have the harmonic geometry of the next dimension above our own, which it appears that we are now moving into. From Joe Mason, we get another point regarding this symbol that is not usually discussed. It now appears that the exact day when it was formed was intended to convey powerful symbolic meaning as well. Genesis 8:4 describes the Ark of the Covenant as appearing on the seventeenth day of the seventh month. Interestingly, it was on July 17th that this all-important formation appeared! Therefore, through careful timing it seems that someone wants us to view this all-important symbol as the Ark. So what exactly is the Ark of the Covenant, you ask? In the Bible it is referred to as a coffin-shaped golden object that possessed tremendous power for those who knew how to harness it. Many authors have speculated that it was a technological device from an extraterrestrial civilization, possibly using radiation as a source of power. This device could produce fabulous power to those who knew how to use it, but it also could cause great harm. According to Bible legends, no one was able to touch the Ark without suffering a fate that reads very much like electrocution. Therefore, the symbolism of the Ark in this formation could refer to the fact that the diagram has some sort of universal secrets contained within it. The Ark therefore has vast symbolic importance in Christian myth, representing the mysterious forces of God being harnessed into manifestation. Our original point of entry into the discussion of the tetrahedral shape in Jesus’ hands is how it pertains to our EE units as given by Seth in previous chapters here. These EE or consciousness units are also the same as the basic geometric shapes being placed within the sphere. Our discussion gets much more interesting as we begin looking at the Barbury shape itself, and start to notice what it is only slightly hiding from view. Here we can see that by gradually clipping out different sections, this image clearly outlines the shape of a four-sided pyramid, or a tetrahedron. Mathematically, this is the simplest three-dimensional shape that can be made. As we have shown, the tetrahedron is the organizing energy that forms the fourth dimension, which we now appear to be heading into. We can then begin to understand why Jesus was shown with a tetrahedron in his hands; Jesus could see the fourth-density energy that forms the Kingdom of the Father. The other, even more obvious form of this geometric knowledge expressed in the Hebrew tradition is the Star of David. This religious symbol is rendered just like a crop circle, where we have a two-dimensional image that perfectly details the appearance of the interlocked, or star tetrahedron, within a sphere. The interlocked tetrahedron is an even more accurate depiction of the actual “appearance ” of Fourth Density energy. Remember that in order for these dimensions to be navigable by entities such as ourselves, there has to be a simple and perfect order to everything. This explains why in Seth‘s readings it said, “We created these cubes to be used as guides. ” In short, through this geometric ordering, you can actually see the energy that you are working with. It appears that this was part of the plan that the One Mind of God originally had for us. Thus, the tetrahedron, with all of its symbolic trimmings, illustrates the fourth dimension as being the “Kingdom of the Father ” that was promised in the Bible as coming to replace the current “heaven and earth” that we have right now. Though we may never actually “see ” this form in the physical plane, the foundation structure of all physical matter has already been “upgrading ” to this frequency in the 20th century. As Ra often indicated, it is only the diehard three-dimensionality of so many humans on Earth that stops our physical environment from already being transformed. As one final note for this chapter, we can point out that the design itself was showing us a dimensional cosmology. If you look back to the photograph, you will see three circles at the corners of the tetrahedron. The first circle has nothing within it but a line extending out to its center point. This would symbolically illustrate the first dimension, or the point, or the Oneness. The second circle has a series of spiraling lines, indicating the “fanning-out” of the point into two dimensions. This is the point where motion is introduced, and the basic framework of vibration for physical existence is first created, as we have already indicated in previous chapters. Then, our glyph for the third dimension is quadrilateral in nature. What it depicts is the top half of an octahedron, shown in the spiraling, spherical form of its energies, and we have already seen that the octahedron should represent the third density or dimension in the Hindu geometric cosmology. If we were to make a paper cutout of this form and pull it up from the circle in the center, we could certainly see the three-dimensionality of this shape. And here, we have an image that shows exactly how this would work- the “hidden” shape pops out as though it was always meant to have been there. So, what we have in the outer circles is a geometric progression of the first, second and third dimensions, illustrated for us in a field of wheat. The fourth dimension is the focal point of the entire formation, represented by the tetrahedron within the sphere in the center. The fact that the three outer circles all add up to the inner circle must also indicate that this fourth dimension is the summation of all that had occurred before it. It is also interesting to point out that the crop was extremely green when this formation was made, indicating the passage to the green-ray vibrational level of the fourth dimension. Gerald Vano is a retired electronics engineer. For thirty years, he has been involved in the studying of science and the spirit. Twenty-five years ago, he went to Egypt and visited the Pyramids. While there, he had an unusual spiritual encounter with a spiritually gifted person. Since then, his whole life changed; he began to experience bursts of revelation knowledge. He then started to have dreams and visions and developed mystic abilities. He is well known in the South Shore area of Boston as a mystic and for his unusual spiritual abilities. See his articles here. Many people believe that aliens are communicating with us today in many different ways, but it seems there is just no real meat that we can sink our teeth into to prove it. This is because we have a government-influenced news media that is leading us to doubt that they exist. Until there is allowed some kind of tangible evidence to be released, we will always be in doubt. I believe that, until now, it probably was necessary for this deceptive government-controlled alien agenda. But, I think the situation has come to a point were it is even out of our government’s hands. Mankind is facing a crises situation just ahead, and I believe the evidence of this is to be shown to the masses. The alien influence is allowing this information to surface now for our own sake. What follows will prove to be undeniable evidence of this and can be understood by any reasonable thinking person. Finally, the aliens are allowing the truth to be released to the masses about a crop circle that appeared in a field on July 16th, 1991 at Barbury Castle in England. It was one of the most sophisticated circles that appeared until that day. It was unusual in that you could tell just by looking at it that there was a message encoded in its design. Many people tried their hand at decoding it. There were many books and websites speculating what the message in its design meant. When I first saw the circle, it seemed that I had an unusual knowing about it. So, I also tried my hand at decoding it. At that time, I was writing a booklet, “The Etheric Ocean Doorway to Other Worlds.” The message I saw in the crop circles design seemed to resonate with a lot of what I had stated in this book. I made a slide presentation of my decoding and put it up on a web site. The response to it was overwhelming. I received thousands of hits on the site. Almost all of the comments I received were positive. Some came from other authors who wrote on the decoding saying they believed I had the right decoding. I was especially surprised when I received very good comments from reputable scientists. Most people have been deceived by the media’s negative publicity given to the crop circle agenda by the claims of hoaxers, Doug and Dave. But today, with the sophistication of the circles that have been appearing, people are realizing that it is impossible for them to be hoaxed. What follows is a detailed description of the message I believe was encoded in the crop circle. I believe what you are about to experience is just one more bit of undeniable evidence that a pole shift on Earth will happen very soon. You see in figure 1 a photograph of an aerial view of the Barbury Castle crop circle. What was unusual about this crop circle was that it was not just a round unsophisticated circle. This one had class! You just knew that there was a message hidden in its design. Well the truth is that there is a message encoded in its design. I believe you will agree with what follows. 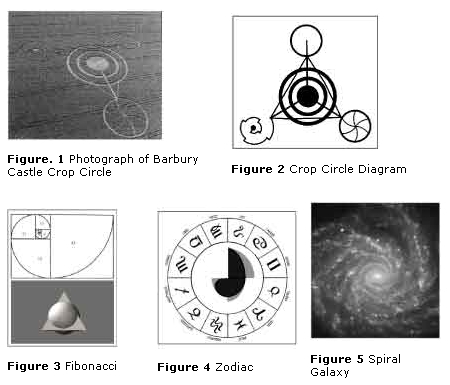 In figure 2 is a diagram of the crop circle. You see in the center of the crop circle a triangle with three struts going from each corner to the center of the triangle. The struts are indicating that this shape is really a three dimensional tetrahedron. Notice how the three concentric circles are superimposed on the tetrahedron. These three circles are indicating a spherical shape. The combination of the sphere and the tetrahedron superimposed on to each other produces a very unusual shape. You can see a rendition of this shape on the bottom of figure 3. To find the reason for this combination, we have to look at the small circle at the top of the diagram. It is obvious that the reason the rod going from the center to the edge of the circle is that they are trying to get our attention to the radius of a circle. What are they trying to tell us about this unusual combination of a tetrahedron and a sphere that has to do with a radius? It has to do with volume. The relationship of the volume of a tetrahedron to the volume of a sphere in a mathematical formula requires the unique parameter of the radius of the sphere. They are trying to tell us to notice the size relationship between the two shapes. In measuring the size relationship of the two shapes in the diagram, I found that the volume of the two shapes were equal. What is the uniqueness of a tetrahedron and a sphere for the aliens to show them? The teachings of sacred geometry tell us that a tetrahedron is a basic 3 dimensional shape and is spiritually in tune with male energy because it is made up of all straight lines. It also indicates time, in that straight lines symbolize linear time. The sphere is spiritually in tune with female energy because it is all curves. It also symbolizes eternity. The aliens are indicating to us, with the unique combination of shapes in the center of the crop circle, something to do with an energy balance of opposites and also something to do with time and eternity. Notice at the bottom in figure 3 when a tetrahedron and a sphere of equal volume were superimposed on each other, how they resemble what is shown in the crop circle diagram. When building the Pyramids, the builders had to know how to square a circle or cube a sphere. This means the circumference of a circle equaled the perimeter of the square. The math to do this involves the number pi. Somehow, the same conditions apply here with these two shapes. If the assumptions I am making about a balancing are correct, then as we proceed, the rest of the decoding will fall into place and show this. On the bottom left side in the diagram of figure 2, we see a shape that looked to me like a fibonacci spiral with a strange ratchet affect in it. The famous Fibonacci spiral is the top drawing shown in figure 3. Leonardo Fibonacci, a medieval mathematician, noticed a particular order or sequence that plant life utilized to grow, and he discovered that this order kept coming up everywhere. The sequence is 1, 2, 3, 5, 8, 13, 21, 34 and so on. This sequence generates a spiral like the one shown. The reason this spiral keeps coming up everywhere originates in the golden mean spiral, which goes in and out forever and has no beginning or end. Life doesn’t know how to deal with something that has no beginning because there is nowhere to start, so the Fibonacci sequence is life’s solution to the problem. Through a process of unusually strange events, which I will not go into here, I was led to superimpose the ratcheted Fibonacci spiral in the center of a zodiac chart. You see this in figure 4. In doing this, I noticed that the ratchets lined up with the four cardinal signs of the zodiac. Then, it all seemed to come together in my mind. What the aliens are trying to tell us is that there is to come a crossing over to a new age, and that every six thousand years there is a disastrous correction in nature that will bring us into this new age. It was said before that the Fibonacci spiral couldn’t follow the golden mean spiral. The golden mean spiral has to do with the spiritual plain, and the Fibonacci spiral has to do with the physical plain. Notice in the drawing of figure 4 the darker spiral in the center of the chart. This symbolizes the golden mean spiral. 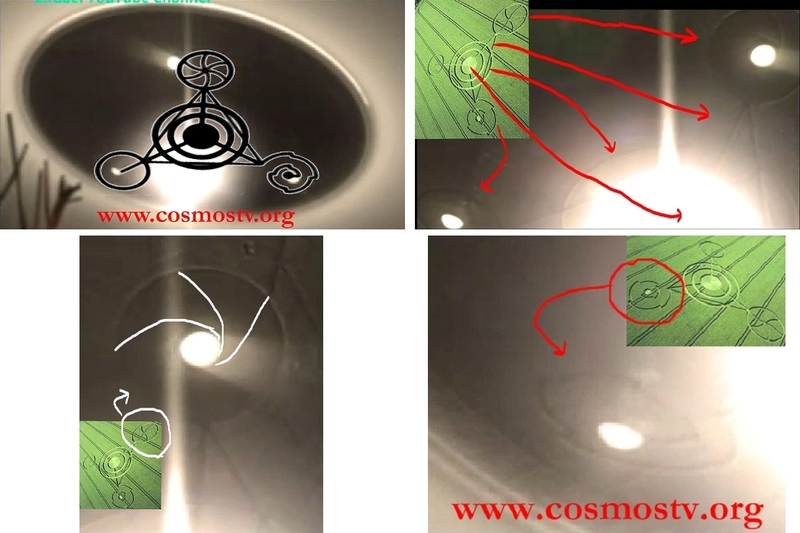 Also notice the lighter ratcheted spiral superimposed on it. This is the Fibonacci spiral, which symbolizes the physical plane. Notice how the lighter spiral advances off away from the darker one. This is because the physical spiral cannot follow the spiritual spiral, and this ratchet or jump back in line with the golden mean spiral is a correcting move or jump that happens every six thousand years to bring the system back into balance. If this is true, then there had to be a correction six thousand years ago and twelve thousand years ago, also. According to the bible, the biblical flood happened six thousand years ago, and scientists say there is evidence that the world shifted on its axis twelve thousand years ago also. It is believed this is when Atlantis sank. The combination of the tetrahedron and the sphere showed us to look for a balance between opposite forces. We see that the ratchet effect in the Fibonacci spiral is to bring a balance back into our system between the spiritual and the physical forces. On the bottom right, there is one more symbol to decode. You see in this small circle a sort of pinwheel effect. It should be fairly obvious, after looking at figure 5, that what they are telling us here is to look at the Galaxy because during the correcting Jump, the earth will shift on its polar axis at that moment of precessonal balance, earth will change directions in its polar wobble motion relative to the Galactic center. At that moment of change, we will enter into an eternal moment when time stops. At that moment, earth will enter the Galactic Age. We are now living in the Age of the Sun. The Egyptians symbol for the Age of the Sun was a square superimposed on a circle. Today, our symbol for the Age of the Galaxy is the tetrahedron superimposed on a sphere. When will these events happen? The Mayan prophecies say that the present time cycle will end in the year 2012. They also say, that the consciousness of mankind will be raised to a higher level at that time. People are excited about this, but what they don’t realize is that the raising of consciousness is due to a bending of time caused by a devastating earthshaking pole shift. The following video includes a slide presentation written by Gerald Vano and narrated by his wife Lorraine Vano, which decodes the Barbury Castle crop circle in a greater detail than his article above. DAVID WEBB: Betty, is there something that they want us to understand right now? BETTY: [After a pause] Yes. DAVID WEBB: Do you know what it is? Can you tell us what it is? BETTY: [Pause] Something about scientists must bury the past. 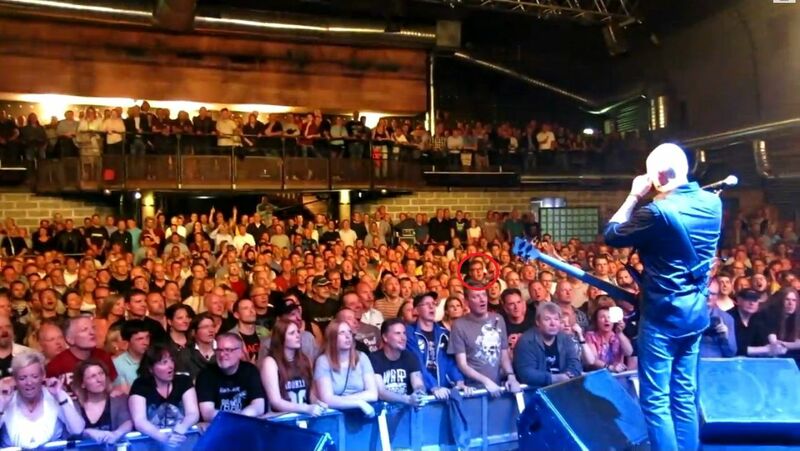 FRED YOUNGREN: Say some more. Tell us some more! BETTY: There is an even flow. There are waves that are being sent out. And there are old walls that need to be broken down. DAVID WEBB: Can you tell us more? FRED YOUNGREN: Does this relate to the formulas that they gave you, or is this different? BETTY: This is different, something about circling the plain. Circle the plain, P, L, A, I, N. Uh — count three and four. Counting three and four is very important. FRED YOUNGREN: Can you tell us what the three and four relate to? BETTY: It’s something about a door, and it’s going to be opened. “Gerald felt led to write the book “THE ETHERIC OCEAN”, it’s as though he was inspired to write it, in the book he speaks about an etheric ground similar to the classical ether that was believed to exist until the early 19 hundreds when it was wrongly done away with by Einstein’s theory of relativity. He describes how this ether is actually our mind and is the mind of all living species in the Universe, it is the unifying place of all energies, that ever elusive place that man of orthodox science with a purely physical point of view such as Einstein looked for but cannot find. In a metaphorical sense it is the resting place, where opposites meets, the place between negatives and positives, matter and spirit, the coming together of male and female, the meeting place of God and the Devil, it is the crossing place from one Era or Age to another and in this sense it is symbolised by Jesus’ cross when he crossed from the Judaea to the Christian Age. In the Christian belief, Jesus is the mediator between God and man, and he said he is the way to the father, and the true sense he is symbolising the etheric doorway to other worlds in the Universe. Keep these words in mind about the crossing place because Gerald will show this very thing is what the symbolism of the Barbury Castle crop circle is saying. In a final sense it is a very real place in nature known as the Universal mind”. In part 2 of the video, Gerald decodes the Barbury Castle crop circle and says that we are about to enter a new “spiritual age of 333”, which is “ruled by piece and harmony” and that “the ether is the doorway to the fourth dimension” with the ether being “the unifying place of all energies” at “the meeting place of God and the Devil”. This is what it now WAS about after the final battle of the end times and after the creation of our New Universe and Golden Age :-). “The symbolism of a tetrahedron with a sphere superimposed on it with the equal volume indicates grounds of male and female energy and also the balancing of time and eternity. Gerald felt at this time that the beings were trying to show that we are about to enter the next dispensation or Age symbolised by the tetrahedron and that we are at the cross over point between ages. A few minutes ago it was said to keep in mind what was said about the cross between ages; it was said that in a metaphorical sense the etheric ground represented this cross over or balancing; when the being was speaking through Betty and was saying/counting three and four was very important, Gerald wrote in his book that he felt that the being was trying to get our attention to the etheric ground. He wrote that three and four meant the third and fourth dimension, the third dimension being the physical and the fourth the spiritual; that the ether is the doorway to the fourth dimension”. This is what the crop circle and Jerusalem UFO was about: All energies of the Universe met in Jerusalem in 2011 for the final battle of the end times between God and the Devil resulting in the light being victorious and the creation of our New Universe including a new Golden Age of an eternal now. “We are leaving the physical age of 666 and entering the spiritual age of 333; the age of the sun is the age of explosion and separation ruled by wars and violence, the age of the galaxies, the age of implosion and coming together ruled by piece and harmony”. Stig: This is saying that life and the Universe is created from out of “nothing” or from “the darkness”, “the Devil” or “666” if you will (! ), we are now leaving this Age of darkness, which will be replaced by a new Golden Age of an eternal now consisting of JOY and HAPPINESS without opposites because all “negativity” of the darkness has been excluded based upon the definition of the darkness in my scripts. The Golden Age will become LIGHT only after the darkness of nothing has been transformed into the light of everything. 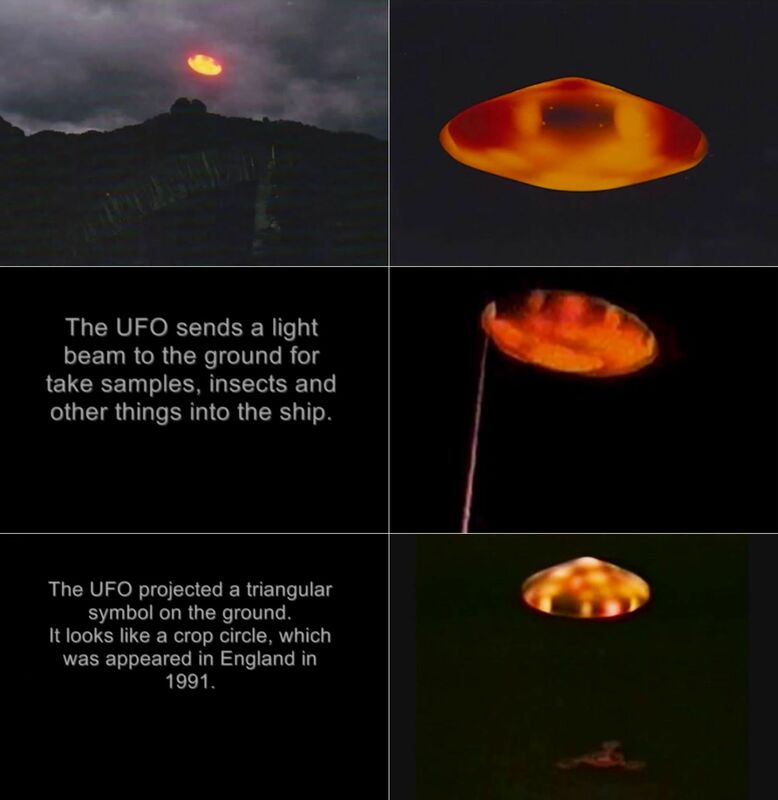 Carlos Diaz from Mexico has since 1981 had regular contact to an orange coloured UFO of pure light as this short video shows. 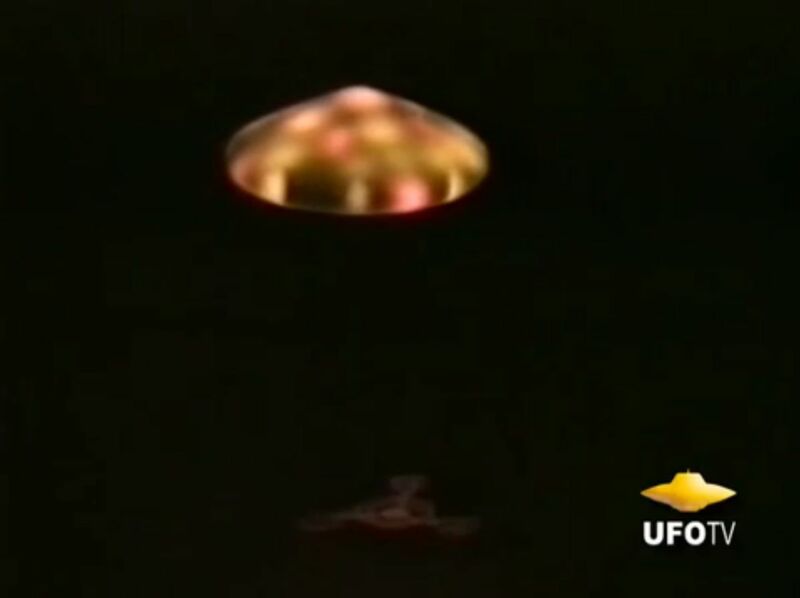 In January 1998 in Tepoztlan, south of Mexico City, he had one of his encounters with the UFO that projected a triangular symbol on the ground, which was the Barbary Castle Crop Circle as you can see from the video below at 03:24, so it was not only in Jerusalem in 2011 that this UFO of pure light flew, it is “everywhere” as I am told spiritually when writing these lines. Here is a longer video about the encounters of Carlos Diaz, which here starts at 59:45, which is the beginning of the story in a greater detail over the next minutes leading to the UFO of pure light projecting the image of the Barbury Castle Crop Circle. Thank you very much to all sources helping to bring the information on this page :-). This website was first published June 2, 2011, and has since been updated some times.